I had a strong feeling that the Dark Gathering 2018 would be an emotional experience, and I wasn’t wrong! There were all sorts of things going on behind the scenes that I won’t bore you with but take my word for it, everyone involved did the very best they could under trying circumstances and limited resources. As a consequence there were a few logistical hiccoughs but nothing that completely ruined the day for others, even though it gave the organisers a few stressful moments. For the last few years my amazing husband Matt Geoffrey and I have attended the gathering in Boscastle. We were all booked for this year it’s always the highlight of our year. Sadly on Monday Matt lost his battle with cancer, he fought like a warrior to stay with us but took his last breath at 9:30pm on 22nd Oct with his mum, myself and our children around him at home where he wanted to be. I would be grateful if you would all remember him this weekend and say a blessing for his passing. The children and I cannot be there but it would be lovely to think he was being remembered. Our little one who turned 4 the day before wanted to walk respect for daddy . 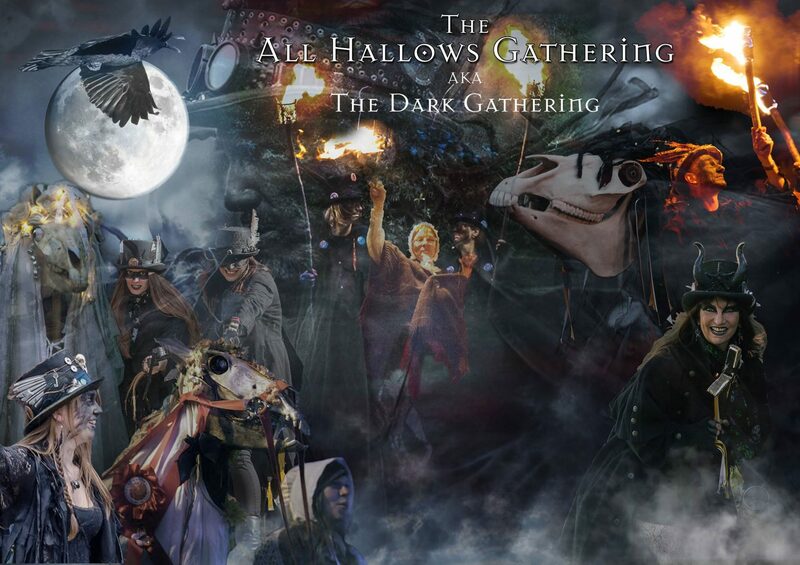 I include all this as it is a very good example of how the Dark Gathering has become more than just a folkloric get together, more than a Morris knees-up, more even than a community event. It has become something unique which was in our minds from the very start. I well remember having an important conversation with Angie Latham and Laetitia Latham-Jones on that wild, stormy night back in 2014. We were discussing the fact that although there are quite a few dark Morris sides who were also of Pagan persuasion, there were no events to honour this. That, and the fact of the Museum of Witchcraft and Magic was the ideal setting at the most powerful time of year for the spirits of the ancestors – it seemed the logical next move to have a magical folklore happening coupled with the meeting of the Osses and Mari Lwyds. The rest, as they say, is history. Recently Laetitia mentioned to me that there was something about the Dark Gathering that reminded her of the movie Field of Dreams. So on to the day itself. We knew from the weather forecast that this was likely to be a cold and changeable weekend, so most folk were dressed accordingly. The first performances started at 2 pm right up the top of the village at the Napoleon Inn. The Mari Lwyds and Cwmni Gwerin Pontypwl gave lively performances for which they were duly paid with the traditional libations of cake and ale. Then they slowly descended the Old Hill calling at various households on the way supported by their trusty musicians who travelled up from Penzance to play for the Mari Lwyds – thanks guys and gals! In fact so impressed have we been by the volunteer musicians that we thought it was about time they had a band name, so… hereafter to be known as Bagas an Werin Mari Lwyd – (translation from Cornish: Mari Lwyd Folk Band) Their final destination at the end of the afternoon was the Cobweb Inn where they performed for the customers and a good time was had by all! Our planned warm-up act was to be the Salt Sisters but sadly they had to withdraw at the last minute due to the illness of one of the duo. Domesday Morris asked whether they could use this opportunity to perform and as I couldn’t see any reason not to, I agreed. The crowd gathered swiftly as usual and once Beltane and Wolfshead & Vixen had set up their band equipment, we officially started the 5th All Hallows Gathering. Once Steve Podger our trusty MC had opened proceedings with his usual flair, I stepped in and dedicated the Dark Gathering 2018 to the memory of Matt Geoffrey. Beltane then led the afternoon’s entertainment starting with a new dance called Three Ravens. They were, as ever thrilling and dynamic to watch. Next to perform was the mesmerising Wolfs Head and Vixen Morris. You get two for the price of one here with the brooding intensity of the Wolfs Head men, and the slick precision of the whirling Vixen women. This is not to mention the trance-like rhythms of the side’s Band. WH&V who hail from Rochester in Kent, are a well renowned side whose claim to fame is of being the very first gothic Morris team. They have built an enviable reputation over the last 23 years and we were delighted to have them as our Guest Side this year. One of the dances that Wolf’s Head perform is called the Four Seasons and is considered to be a form of fertility dance. Usually a female is chosen to stand in the centre and Laetitia Latham-Jones was chosen this time. This might have had something to do with the fact that Laetitia was a member of Wolf’s Head and Vixen back in the Nineties so this was a nice gesture from them. The dancers were led by the irrepressible Bruce Jarvest. I also have to mention the children at this point. Who couldn’t fail to smile at these winsome kids in their tatters and blacking? These kids went around the crowd asking for donations for the Museum of Witchcraft and Magic. They raised the princely sum of £60! Impressive! Then suddenly at 4 pm when there was a scheduled break in the Morris dancing, the heavens opened up and the rain hammered down! Reblogged this on Grumpy Old Witchcraft. Fascinating! I always love to read your writing, Cassandra.. Great to read a first hand account of the day. Can’t wait for the rest of it! Previous Previous post: Stop Press on Dark Gathering!